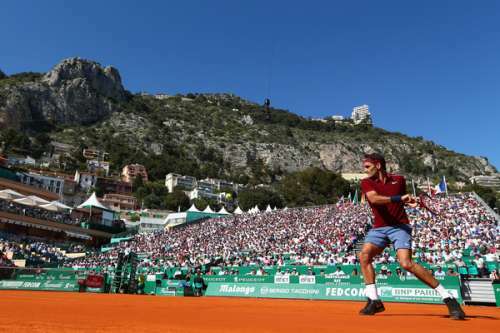 17-time Grand Slam champion Roger Federer made his much-awaited return from knee surgery as he cruised to a 6-3, 6-4 victory over Spanish World No. 38 Guillermo Garcia-Lopez to enter the third round of the Monte Carlo Masters on Tuesday. It did not seem like the third seed was away from competition for 10 weeks as he looked very sharp in his opener at the tournament where he had reached the final four times. With 64% of first serves, the Swiss maestro made short work of the Spaniard, breaking him thrice. The only blip in his form came when he was broken serving for the match at 5-2. Federer had not played since January’s Australian Open and was supposed to make his comeback at the Miami Masters in March but a stomach illness delayed it further. The 34-year-old seemed pleased to be back to the grind and said that he is taking his recovery process day by day. He will next face the winner of the match between 14th seed Roberto Bautista Agut and Frenchman Jeremy Chardy. On the other hand, Madrid Masters champion Andy Murray’s first match on the red dirt this season turned out to be quite an ordeal for the new father. The second seed dropped a set but managed to steady the ship in the decider to edge past the 95th ranked French qualifier Pierre-Hugues Herbert, 6-2, 4-6, 6-3 in 2 hours 6 minutes. The scrappy Murray was broken four times while he managed to make in-roads into his opponent’s game six times. Since the Australian Open where he reached the final, the Scot has managed to win just two ATP Tour matches as he made early exits from Indian Wells and Miami. Eighth-seeded Jo-Wilfried Tsonga carved out a 7-6(1), 7-6(5) victory over World No. 51 Pablo Carreno Busta in his opening match at Monaco. His compatriot – the 15th seed Gilles Simon – joined him in the third round with a comfortable 6-4, 6-3 win over Grigor Dimitrov. 11th seed David Goffin, who has recently made quite an impression by reaching back-to-back semi-finals at Indian Wells and Miami, continued his good run with a 7-5, 6-0 win over Feliciano Lopez in the first round. Other winners of the day included Philipp Kohlschreiber, who prevailed 6-4, 6-4 over rising star Borna Coric. Wildcard Fernando Verdasco, a former runner-up at the Principality, beat Marrakech titlist Federico Delbonis, 6-0, 6-3. 31st ranked Fabio Fognini, meanwhile, fell to countryman Paolo Lorenzi, 6-2, 0-6, 1-6.